Early signs of a systemic shift in higher education towards significant use of English can be seen across some continents where English is not the usual spoken language. Such a shift derives from universities’ efforts to internationalize and capitalize as they navigate the currents of globalization. The use of English as the Medium of Instruction (EMI) as pedagogy should be examined more closely in the context of the concurrent growth of higher education around the world and the increase in the number of international (and local) students who are studying in English as a Second Language (ESL). A robust model of EMI as pedagogy is presented, which can be useful in supporting an internationalizing institution’s EMI policy. The world of higher education is growing and shrinking. As tertiary enrollment around the world grows and the number of international students increases, English asa Lingua Franca (ELF) is shrinking distances between people in higher education. ELF is present in the higher education teaching activity where it is known as English as the Medium of Instruction (EMI), especially where students using English as a Second Language (ESL) are involved. 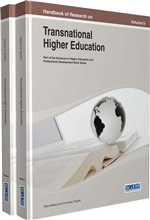 The roles of ELF and EMI in higher education research and the teaching of international students have become so pervasive that it is producing change even in non-Anglophone national systems of higher education. With large numbers of EMI programmes now being offered by tertiary institutions in some of those nations, it appears that we are in the early stage of intercontinental, systemic change. An expanding circle of tertiary students in those institutions are being taught in EMI and they are learning in ESL: some are local students and some are international students but all are using English as part of this systemic change. I have several objectives in this chapter. I summarize trends in EMI developments in many non-Anglophone European and Asian countries which affect both international and local students. I focus on those countries since they are where systemic change towards EMI is nascent. Integral to the change are local and international students as well as faculty increasingly using English as a Second Language in higher education. While accepting that as a policy EMI can be one of several pillars supporting an institution’s broader goal to internationalize, I want to argue that without developing solid EMI pedagogy to operationalize an EMI policy, such a policy pillar may be porous or in other ways unstable, thus endangering the broader goal to internationalize. Hence, I will also look at broader issues of globalization and internationalization and how those are tied to the growth of higher education and English. The relationship of these components is presented in Figure 1. My other objectives in this chapter are to problematize EMI in higher education, present an argument for EMI’s importance in internationalization, and present a model for EMI pedagogy. International Students: Meant here as students who study at higher education institutions outside their countries. Many of them do so in English as a Second Language (ESL). L1: First Language, i.e., native language, of a person. ELF: English as the Lingua Franca, i.e., English language shared internationally. EMI: English as the Medium of Instruction, bifurcated in this chapter as EMI as pedagogy and EMI as policy. EML: English as the Medium of Learning. TESOL: Teaching English to Speakers of Other Languages.